Summary: Dreary day today. Tuesday and Wednesday look pleasant. Wednesday night is when shenanigans happen. Cooler lows toward the end of the week. 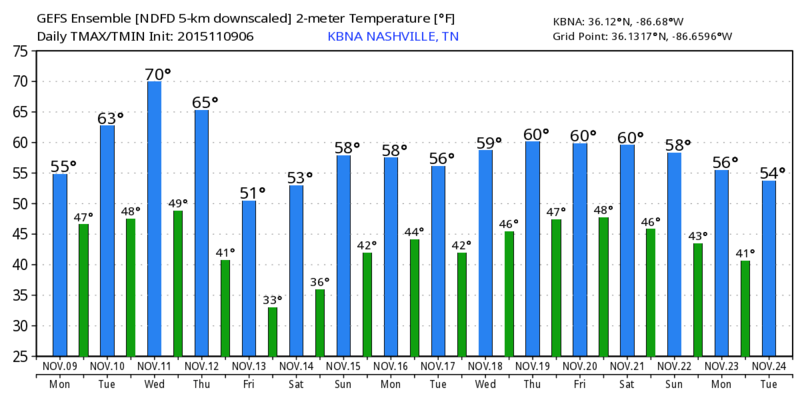 Welcome to Tennessee’s secondary severe weather season, that often peaks during November. If that isn’t a way to start a weather post, I don’t know what is. We had a small taste of it last Friday early morning when a line of storms moved through, bringing with it gusts of wind. It was never severe for us as it moved through the 2-4am range. It was just very windy, and while we never had a severe thunderstorm warning, we did get this Significant Weather Advisory thanks to the wind. However, this week our chances improve a bit to see some severe weather. But before we get to that, let’s outline the next two days. Today, we’re looking at drizzle and dreary conditions. As of this writing, most of the drizzly stuff has moved north. We’ve all but reached our high temperature for today of 56 (at time of writing it was 55). The HRRR model wants to keep us dry for the rest of the day. While we technically have a 60% chance of precip today, that chance was this morning and we shouldn’t see any more than a sprinkle or two for the rest of Monday. Monday night into Tuesday morning, our low temperature will drop to about 46 degrees under cloudy skies and calm winds. Tuesday, clouds will start to dissipate bringing some sunshine with our high temperature reaching about 63 degrees. Winds will be 5mph out of the north northwest as the clouds move out. Tuesday night, skies will be mostly clear as our low temperature falls to about 47 degrees. Winds overnight will shift coming out of the north northwest to the east southeast. Wednesday is when our weather will start to shift. We will have a 20% chance of rain and thunderstorms after 12pm on Wednesday, with a high temperature reaching a very mild 73 degrees. Winds will start the day out of the south at about 5 to 10 mph, then increase to 10 to 15 mph in the afternoon. Gusts up to 25 mph are expected. While that is the official NWS forecast, NWSNashville believes we could see a steady wind of about 20 mph with gusts up to 35 mph, which may prompt a Wind Advisory. Here comes the shenanigans. In November in Tennessee, when winds come out of the south and start to increase in speed and temperature goes up to a unseasonable level, you better start looking to the west for a cold front. That’s exactly what we’re going to be dealing with Wednesday, mainly Wednesday night overnight into Thursday morning. A very strong low pressure system will move north of us through the Great Lakes region, sweeping a cold front with it. The Storm Prediction Center acknowledging the power of this storm system as early as their Day 5 outlook (published Saturday). We tweeted about it when it was in the Day 4 outlook. It’s important to note that they also had the 15% chance yesterday as well (5 days out). Here we are on Day 3 and the convection outlooks are a little more detailed. 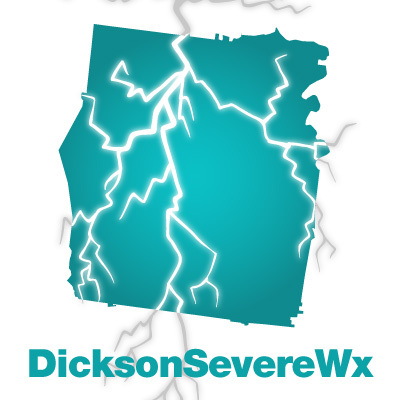 All of Dickson County is in the SLIGHT category for severe weather (a 2 on the scale of 0 to 5). The SLIGHT categorial risk carries with it a 15% chance of seeing severe within 25 miles of a point. 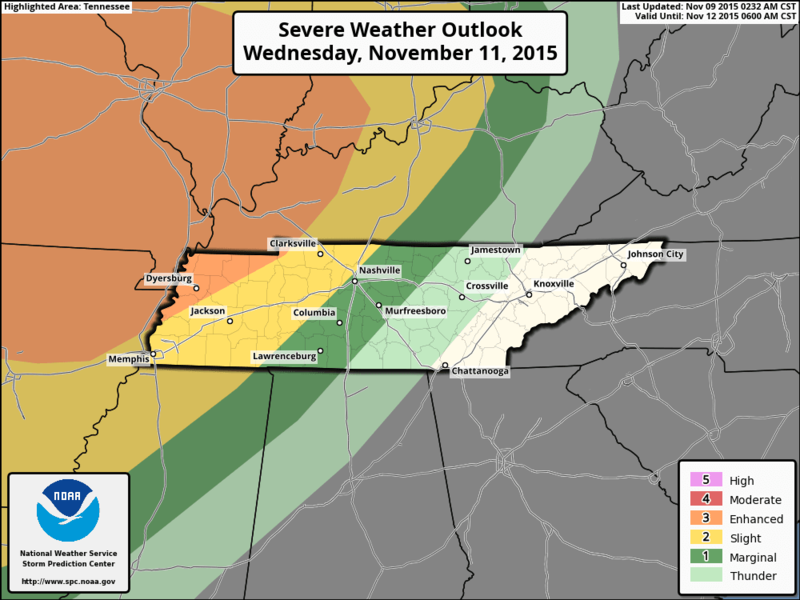 NWS Nashville has outlined that the main mode of severe weather we could see would be damaging straight line winds. All of this isn’t to make you panic, but for you to understand that this event could lead to strong to possible severe storms. The main threat is damaging winds, but the SPC hasn’t ruled out a possible tornado. Below is their nerdy weather writeup, with our added emphasis underlined. AS THE UPPER-LEVEL TROUGH BECOMES NEGATIVELY-TILTED AND THE MID-LEVEL JET MOVES INTO THE MID MS VALLEY WEDNESDAY EVENING...A WIND DAMAGE THREAT IS EXPECTED TO CONTINUE EWD INTO THE OH AND TN VALLEYS. 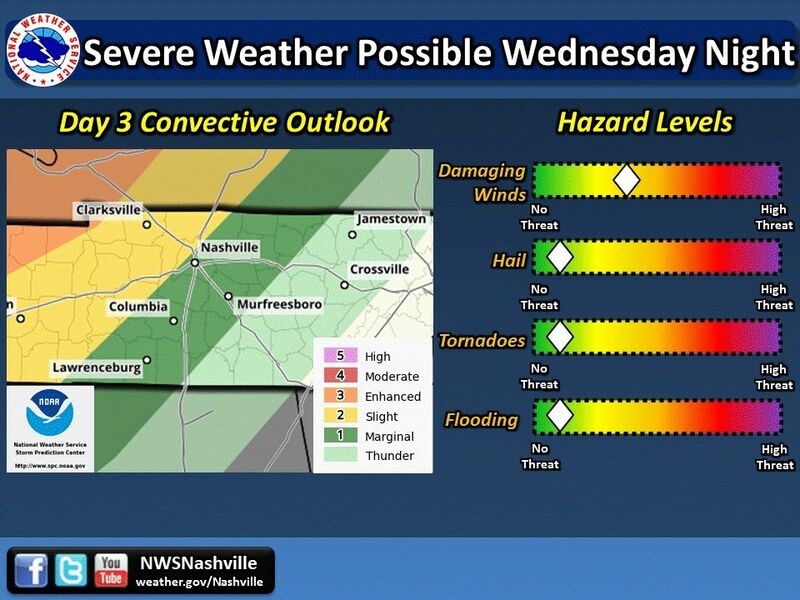 AN ENHANCED WIND DAMAGE THREAT WILL BE POSSIBLE AS FAR EAST AS SW IND...WRN KY AND NW TN WEDNESDAY EVENING WITH THE THREAT BECOMING ISOLATED DURING THE OVERNIGHT PERIOD. A FEW TORNADOES ARE ALSO POSSIBLE DURING THE EVENING. 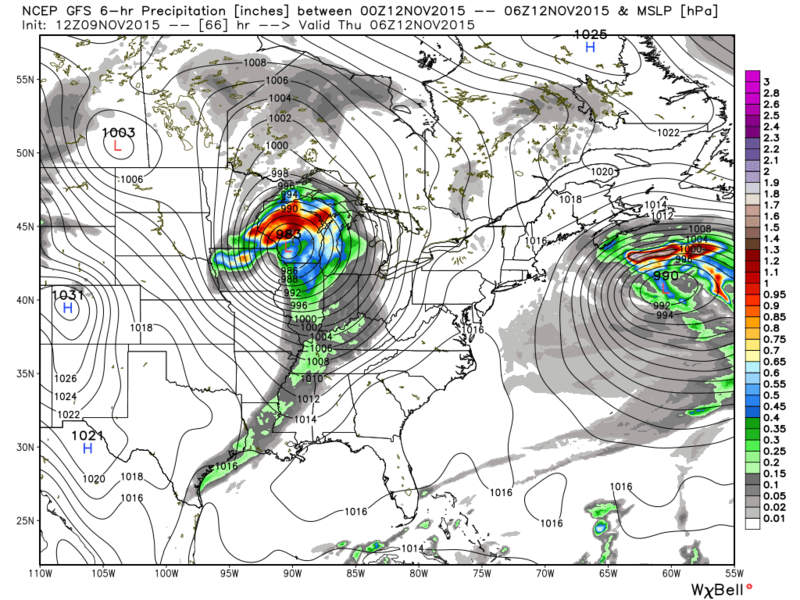 The timing of the system seems to be during Wednesday night and Thursday morning. With the timing being at night, most of the daytime heating energy will dissipate, giving the storms minimal energy (aka CAPE) to work with. However, the strong gradient of pressure keeps the winds pretty strong and gives them something to work with. The above shows you the super strong low pressure system (down in the 980 mbs!) with the cold front and line of showers. This GFS model shows the amount of precipitation expected in the 6 hours between 6pm and midnight. We’ll know more tomorrow about the forecast, what to expect, and some simulated radars from models. Until then, just keep in mind that another overnight storm could wake us up, this time it might have a warning or two with it. Wednesday overnight, temperatures will drop to a mild 49 degrees with a 90% chance of rain (aka the cold front). Thursday our temperatures will drop a bit thanks to the cold front bringing some possible severe weather. Rain will move out giving us mostly sunny skies and a high temperature of about 61 degrees. It will be gusty throughout Thursday as the cold front moves through. Winds will be out of the west at 5 to 15 mph, with gusts as high as 25mph. Thursday night, temperatures fall to about 40 degrees under mostly clear skies. Winds will turn slightly to come out of the west northwest at about 5mph. Thankfully Friday the 13th won’t bring us any bad weather, just cool temps. The high will reach about 56 degrees under sunny skies. Winds will still be out of the west northwest at 5 to 10mph. Friday night, our low will flirt with the freezing mark at 34 degrees under clear skies. Season-like temps are expected after the cold front. Mid to upper 50’s for highs, and mid to upper 40’s for lows. Next Next post: Thank you for an amazing 2015!